One of the best portals to publish your indie and casual games! FreankExpo is a portal about indie and casual games borned in the March 2011 where the users can submit their works and release them to the players. There are all genres avaibles (RPGs, action, adventure, ecc...) and a section dedicated on developing games where people can found engines and resources to make one. For tempting the people there is a classification based on points collected by posting comments, rating games and publishing games. The staff makes periodic contests and tournments for players and developers, to enjoy them and collect more points. The FreankExpo also launched an YouTube channel http://www.youtube.com/user/RetroGamesIndie ) where developers can send videos of their own games and there will published demos videos of popular indies. There is a Facebook page http://www.facebook.com/pages/FreankExpo/222239234471888 where there will posted news and the people can easily contact the Staff. The website is avaible in english, italian and german and, with the help of Monos and Kilam1110, french (cooming soon : spanish) languages. 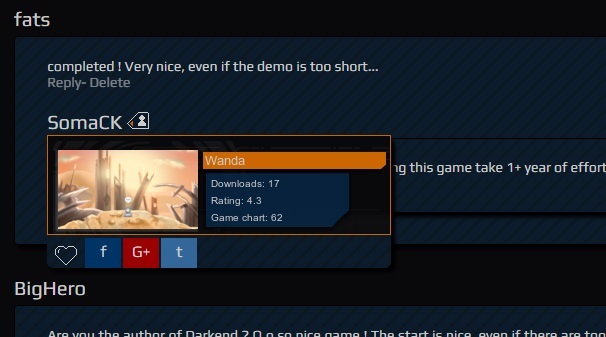 - Easy interface to publish your games in automatic mode and a panel where you can manage your games. Thank you for giving us this information, i didn't now this project, and it's a pretty good thing. Good thing that Monos & Kilam1110 are giving you some help. By the way, what place do RPG Maker games have in this website ? Are they in the forefront, or in the background ? It is called an "expo", is it going to be a kind of museum website ? You can make a partnership with our RPG Maker competition website by filling in this form. Yes. It is called "expo" 'cause it's a kind of museum, exposition of free indie games. About the pluace of rpgmaker's games... they are considered equal to other games made by other tool or programming languages. I think that it's not like you make a game, but what game you make. Hi guys ! i refresh this old topic! The FreankExpo dies to live again through Indiexpo.net. The soul is the same but with a modern armor. The heart, the games, continue to give it life. We want to continue to grow up. And to do this... we needed to evolve. 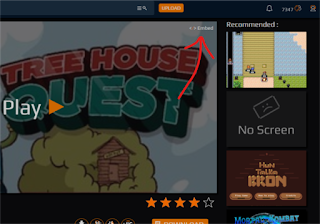 New features are already visible: you can put more downloads, upload games on our server (max 750MB), upload and play online HTML5 games (on PC, Tablet and Smartphone). Over 1,000 Like on Facebook ! So, guys... what features do you want to see in the website ? I'd like to do the same for games that we can play directly in the browser (even if the "Now loading" message is quite ugly). Anyway, thank you for this update, and keep up the good work. OMG. I never update this topic! There was so many new features and improvments in this years! I have to make a short list! - Over 2,000 FREE Games uploaded! - Feed Rss for your News-Game-Page ! - Added AMP (Accelerated Mobile Pages) for each game and user page. - Added new Languages : Russian, Polish, Japanese, Chinese, Indonesia, etc. We made a "new gamepad", a new way to play the MV games (and other html5 games). If you have an android smartphone, go here and download the app (it’s free and always will be). Then select one of those games (my suggestion: Mom or ParaDog made with MV by artgames! wow)... scan the QR code with the App... and now you can play it using your smartphone like a gamepad! How to add it at your game? It's very very easy. It works only for the games made with MV. Upload the zip of your game (like a html5 game) and click on "Enable indiepad support". - Now you can add a game to your subscription directly in home page, clicking on the heart. Easy and fast. - 40 Games that support the Score System! - Language problem on the website? Now you can select your language on Settings Area! - Are you playing an online game and received a notification? Now you can move the mouse on the top and open the Notification Area, no exit from your game! - Over 1,000 Users are using our Chrome Extension, to play online game from your browser! - Adding the Chromecast Support to our indiepad app, to use your TV like a free virtual game console! Follow us on Facebook or Youtube! Edité pour la dernière fois le 10/11/2018 à 11:48:54. La page a été calculée en 0,260095 secondes.